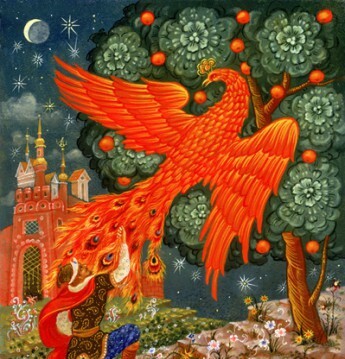 A story for Christmas–based on a beautiful Russian folktale which I retold and which was first published in Once Upon A Christmas. The gorgeous illustration is by David Allan. Enjoy–and merry Christmas to everyone! A long, long time ago, there lived an old woman whom everyone called Babushka, which means ‘Grandmother’ in Russian. Now Babushka was a widow who lived alone, and she was so house-proud that she spent nearly her whole time cleaning and sweeping, dusting and polishing, scrubbing and washing. Day and night, it was all the same to her, and she was so busy that she hardly had time to say good morning to her neighbours in the village, or to watch the sunset, or to hear the song of birds, or to delight in the play of children, or to smell the first roses of summer or the first fall of snow in winter. 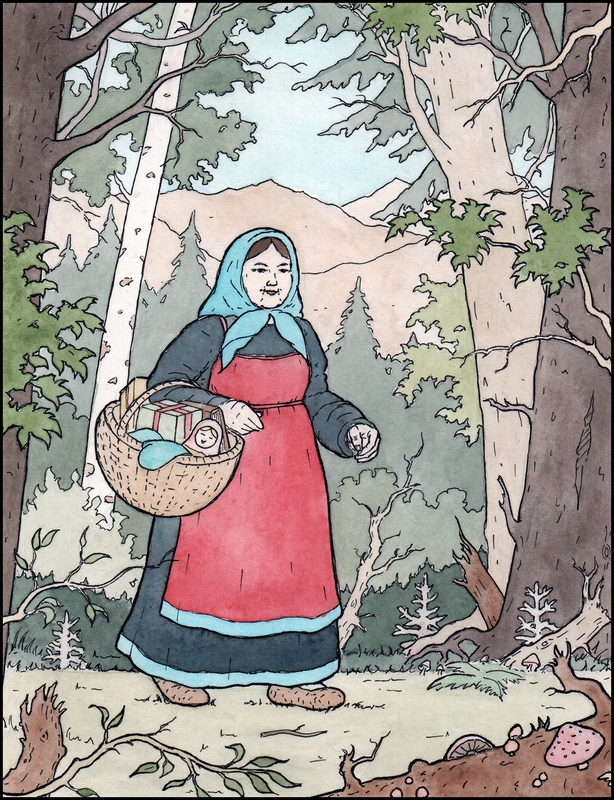 Her house was the cleanest and freshest and cosiest in all of the village, but though Babushka was kind and hospitable, and sometimes invited people in for a glass of tea, they would soon feel uncomfortable, for she would fuss with dishcloth and broom the moment they sat down. One bright winter’s morning, Babushka was scrubbing her doorstep when out came the next door neighbour from her house. ‘Wasn’t it a beautiful star last night?’ she said. So off went the baker’s boy, shaking his head. Now Babushka finished dusting her shutters, and started work on polishing the brass door-knob. Soon, along came a little girl bouncing a ball. ‘That knob is almost as bright as the star last night!’she said. But she was talking to thin air, for Babushka had gone into her house and slammed the door. How silly people are! Babushka thought to herself as she went about her cleaning and polishing indoors. So much work to be done, and they waste time staring at the night sky as though they’d never seen it before! Of course she could hardly remember the last time she’d looked at the night sky. But she was too busy for that. Night had almost fallen by the time Babushka decided it was time to start cooking her dinner. She had just made a pot of mushroom soup when there came a knock on the door. She went to open it and stared in amazement for there on her well-scrubbed doorstep stood a tall black man dressed in fine golden robes, with a golden turban on his head. Behind him stood two other men, one round and blond with a bushy beard, fur-lined robes and a gold-trimmed fur hat, the other small and dark-haired and almond-eyed, with dark blue silk robes and a hat of the same colour with golden silk tassels hanging down. And behind them were three odd creatures Babushka had never set eyes on before, tall and yellow-brown, with haughty faces and humps on their backs. Each of the beasts was richly saddled and bridled, and each of the men carried a small chest, inlaid with ivory and gold. Babushka had never seen such a sight. Why, they looked like three kings, she thought. And here they were on her very own doorstep! The tall black man smiled. ‘I am sure the camels will not mind at all,’ he said. ‘Because it heralds the birth of a great king,’ said the tall black man. ‘And we want to give the royal baby gifts,’ said the round blond man. ‘Gold and frankincense and myrrh,’ said the small dark-haired man. ‘Those are beautiful perfumes,’ said the tall black man, seeing she looked puzzled. ‘Gifts fit for a king,’ said the round blond man. ‘But aren’t you kings yourselves?’ asked Babushka, curiously. ‘Oh, the star!’ said Babushka, shrugging. ‘Look,’ said the round blond man, pointing at the window. And now Babushka could see it, a star brighter than bright, shining in like the shiniest diamond, so beautiful your heart might break, seeming to get bigger even as she looked at it. And she wondered how on earth she’d missed it before. ‘Very well, as you wish,’ said the tall black man, rather sadly. ‘Make sure then to follow the star.’ And now the three kings thanked her, very politely, and left, riding on their camels just as though they were horses. How strange the world is, thought Babushka as she waved goodbye. And then she went back inside and shut her door. But she could not sleep. So she scrubbed and cleaned. But her mind kept slipping from her work. Once, a long time ago, she’d had a baby of her own. But the child had become sick and died in his third winter. Babushka had not thought of the child in years and years. Now she could not stop. ‘I had some little toys for him,’ she thought. ‘A top, a ball, a drum, a little wooden soldier. Maybe I can bring those for the royal baby when I go to visit him. ‘ She went to the chest where they were kept. Oh! They were dusty and a little stained. They wouldn’t do. Not at all. Not in this state. For hours, she worked on those toys. But she was so tired she fell asleep. When she awoke, it was early morning, and the star had gone. A strange feeling seized her. She could not wait. Not any longer. She had to follow those kings. She had to catch them up! So quickly she pulled on her warmest coat and hat and gloves, put all the money she had in her purse, packed all the toys in a basket and set off along the road the kings had taken. She walked and walked and walked, for hours and hours and hours. She stopped in villages and towns to ask if they had seen the kings, and every time, people said, ‘Oh yes, they’ve only just passed, they’ve taken this road,’ and so, stopping only to buy a little food, and another toy to put in her basket, she would take the road they said, and hurry, hurry, trying to catch the three kings up. But always, they seemed to have just passed by, and she could not catch sight of them at all. When night fell, she waited for the star to come out, and sure enough it did. But it seemed fainter now, further away. Still Babushka kept walking. ‘A palace? Oh no, this baby was born in a stable,’ said the man. Babushka remembered what the tall black man had said, about it being a mystery. ‘Did the star shine above the stable?’ she asked. ‘Oh yes,’ said the man. ‘And there were angels. And shepherds too,’ he added. ‘And the three kings,’ said Babushka. ‘Egypt,’ said Babushka, not listening to the rest. ‘Then Egypt is where I’ll go. Can you point out the road to me?’ And she set off again, walking, walking, walking. She is still going, with her basket of toys on her arm. One day, maybe you might see her, trudging along the road, following a star that only she can see. She might stop in your town, and ask everyone if they have seen the three kings. And then, quietly, she will leave toys behind for all the children, to lighten her basket for the long road ahead. She will never give up. For she will never stop looking for the little child born under the miraculous star.